Can your child think of words to describe how a giraffe jumps, how a horse trots, or how dragonflies fly? 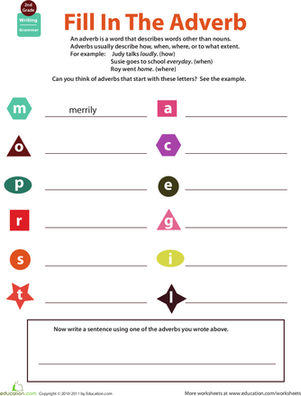 Teach them all about adverbs, words that describe verbs, with a little help from this creative grammar worksheet. They'll think of an adverb that aptly describes each animal action, and at the end they'll write two sentences using a few of the adverbs they came up with. Adverbs, adverbs, and more adverbs. 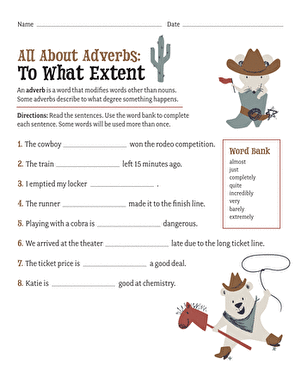 Check out the rest of the All About Adverbs series. 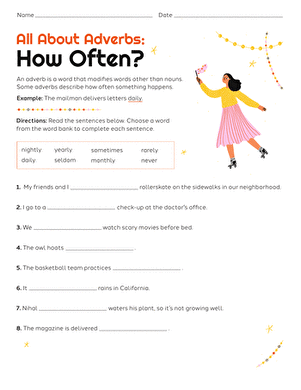 Test your second grader's adverb know-how by challenging them to think of an adverb to describe the actions in this worksheet.